Butch Cassidy and the Sundance Kid is one of the greatest westerns of all time, and it was made at a time when westerns were definitely on the decline. This is actually a funny movie. Most of the film is a comedy, with Paul Newman delivering one of the best comic performances of his career as the amiable outlaw Butch Cassidy. Robert Redford’s breakout performance as the Sundance Kid, plus the very real onscreen chemistry of the two leads, resulted in a generation of “buddy” films where two guys were paired together in various action roles. But the unexpected bonus of this classic is the masterful direction by George Roy Hill. He had a flawless script by William Goldman, and two A-list actors to work with, but the film could easily have been forgettable in a less talented directors’ hands. Hill used a classic old-time musical score, arranged by composer Burt Bacharach, which permeated the entire film with an essence of nostalgia for a time long past. And his ability to weave the storyline through various scenes of the gorgeous Old West landscape interwoven with tight close ups of the gorgeous actors and their often hilarious dialogue was pure genius. “Considered by many Hollywood insiders to be the best screenplay ever written, this film originally included some scenes that were reportedly scrubbed because Paul Newman couldn’t say the lines without laughing. Yet this is a poignant film at times that focuses on two real-life outlaws on the run for their crimes. The parts we remember most vividly are those that give the movie the aura of a “buddy” picture, than an action-adventure comedy, and finally a western very much of the sixties. 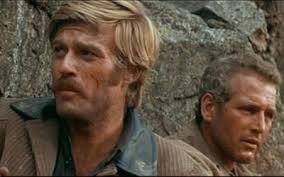 Butch Cassidy and The Sundance Kid airs Sunday, January 17th & Wednesday, January 20th. The film is playing at select theatres in collaboration with Turner Classic Movies.